The objective of this study was to describe our rate of extrusion of dermal allograft material when used in anterior or posterior colporrhaphy and to review our success in treating extrusions with conservative management. 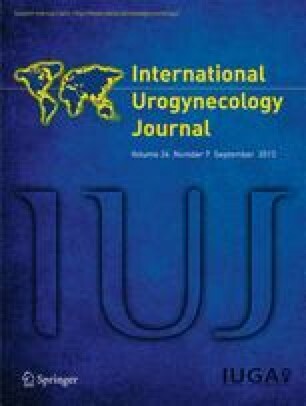 A retrospective review of all subjects who underwent vaginal reconstruction using dermal allograft material from 1 January 2000 to 31 August 2003 was performed. Demographics, medical history, and follow-up were evaluated. For subjects who developed an extrusion, treatment details were recorded. Sixty-nine subjects underwent colporrhaphy using dermal allograft material during the defined time period: 21 anterior, 45 posterior, and 3 both. Five subjects did not appear for follow-up. Seven subjects (10.9%) developed an extrusion: three subjects anteriorly and four subjects posteriorly. There were no differences between subjects with and without extrusions based on recorded risk factors. Median time to the discovery of extrusion was 4 weeks (range: 1–6 weeks). All patients were managed with estrogen vaginal cream. Median documented healing time was 13 weeks (range: 5–40 weeks), and no serious morbidity was encountered. Graft extrusion is an uncommon complication when reinforcing vaginal tissue with dermal allograft material and can be safely and effectively managed with vaginal estrogen and expectant management.